Home » International » Did Assange Make a Deal with the Devil? Did Assange Make a Deal with the Devil? I have been reluctant to write anything about what has been going on in Russia because, quite frankly, I am more afraid of the KGB (now the FSB) than I am the CIA. From this point on I will refer to the FSB (Federal Security Service of the Russian Federation) by their old name, the KGB. Some may disagree with me on this matter but having come from Eastern Europe the reader can understand my apprehension upon the announcement that Wikileaks founder Julian Assange joined up with the Russia Today (RT). RIA-Novosti, the state-owned media organization, sponsors RT. Novosti is essentially an arm of the KGB. The KGB seemed to disappear with the fall of the USSR. Those who know better, understand that nothing ceases to exist. It just changes forms. The Soviet system was never abolished, it moved underground. The KGB simply changed its name and is now called the FSB. Russia Times has been giving the American public an alternative to the mainstream media since the onset of Occupy Wall Street, though I cannot help but to sense KGB agenda. In 2003, the Statute on Federal Security Service of the Russian Federation and Structure of Federal Security Service Agencies allowed the FSB to absorb a number of other agencies. Most notably, the FSB took over the five month-old Special Communications and Information Service, the successor to FAPSI. FAPSI, the Federal Agency of Government Communications and Information was Russia’s equivalent of the American National Security Agency. The FSB then became responsible for electronic surveillance and intelligence-gathering. This expansion was controversial because FAPSI ran the computer system that processes and reports the results of elections. There is no significant proof that the Russia Today is affiliated with the KGB except for the money trail. But bear in mind that this is an information war with Twitter Bombs and Facebook Likes. The general consensus after the fall of the USSR in the early 90s was an American feeling of triumph over the forces of evil. We know now that is more like evil versus evil. The intelligence community in Russia simply took power and reverted Russia back into the Czarist system. There have been several documented incidents of the KGB infiltrating public access news networks like CBC (Canadian Broadcasting Corporation) and most likely a slew of other occurrences. The KGB infiltrated the Black Panthers and other civil rights groups. Not all Marxists in the US are spies, but a conglomeration of Marxists provides opportunity for intelligence circles to infiltrate. There are many good people who call themselves Marxists and Anarchists, but intelligence interface is structured to exploit idealists. I have always found it interesting how many spies start as activists and fine-arts students (the two are related). The father of the CIA was a poetry student. It has also been reported by the Washington Post that there has been an upsurge of KGB activity in the last five years. Once Putin took power the intelligence budget exploded by some 40%. In June of 2010 a spy ring was exposed in New Jersey. Anna Chapman became the spy darling of the media who coined her as a “femme fatale.” The important development of that case, and her subsequent deportation, was the use of social networking and Internet by the KGB agents. I am hard-pressed to find anything written that questions the network’s affiliations. The argument can be made that we wouldn’t question BBC or NPR. But that is not what RT is. Another argument was made in the ’60s and ’70s that activists were just using these elements, but in most instances one cannot use these elements without lending oneself to them. The thought process from which came my-enemy’s-enemy-is-my-friend, is an artifact of the Cold War past. Standing at our vantage point of history I hope that we can all agree that both sides behaved badly in an ideological war. It is not a question of who was worse. Ideologies do not wage war, people do. By choosing the lessor of two evils, we choose devils. 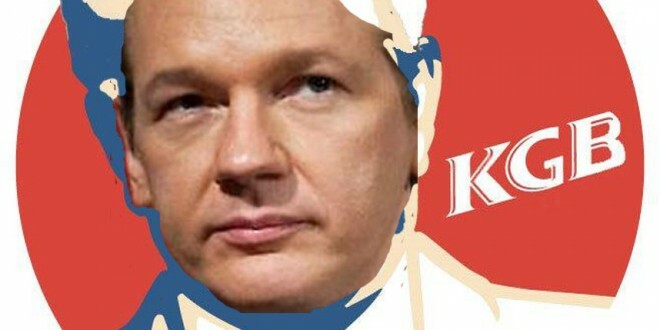 All that being said, I am cognizant of the fact that the whole Western world wants to prosecute Assange. The Russian embrace might seem more welcoming than that of the West. There has been an overhaul and a makeover. RT seems like a legitimate news source but only if you do not live in Russia. The broadcasters are mostly American and casual. They wear jeans. My insinuation is mostly with the ownership but the PR job done on the old USSR persona is staggering. We follow the money with the American corporate media; Our friends at RT should share the same burden of proof. The public has a short term memory. There have been reports of the KGB in the United States as recently as last year, which would also raise questions about how WikiLeaks would function outside of just being an instrument of shaming the West. I can say with certainty no whistle-blowers from the Russo-East will go to anyone affiliated with Novosti or RT. There is also the issue of the countless journalists who have been killed by the long-arm of the Russia’s cloak-and-dagger shadow government. The most famous of which, Anna Politkovskaya, remains unsolved. The general consensus, like with polonium poisoning in the UK, is that the KGB struck in almost all cases. Nothing has ever been proven; the world just assumes. Karol Olesiak served on the USS Ronald Reagan CVN 76 from 2002-2006. He is a plankowner and a graduate of The New School in New York. In 1986 his family escaped Polish Communism by way of Greece due to Polish Martial Law. Karol and his family have been covered by the Christian Science Monitor and appeared on Good Morning America twice.